iMacsoft Video to Audio Converter is professional and outstanding Audio Converter and Video to Audio Converter designed just for Windows users to convert MP4 to MP3, MPEG to MP3, OGG to MP3, etc. with ease. iMacsoft Video to Audio Converter can also convert various video formats including MPEG1, MPEG2, MPEG4, WMV, AVI, MP4, 3GPP, 3G2, MOV, RM, RMVB, OGG, DV, H.264/MPEG-4 AVC, etc. to popular audio formats such as MP3, WAV, AC3, WMA, M4A, OGG, AAC, etc. The converted audio files can be played on different audio players such as iPad, iPod shuffle, iPod nano, iPod nano 5G, iPod classic, iPod touch, iPhone 3, iPhone 4, iPhone 5, iPhone 5S/5C, iPhone 6/6 Plus, Zune and regular MP3 players and so on. The excellent Audio converter provides more parameters, like bit rate, frame rate, audio encoder settings, batch conversion and audio channel to set for personalized conversion. 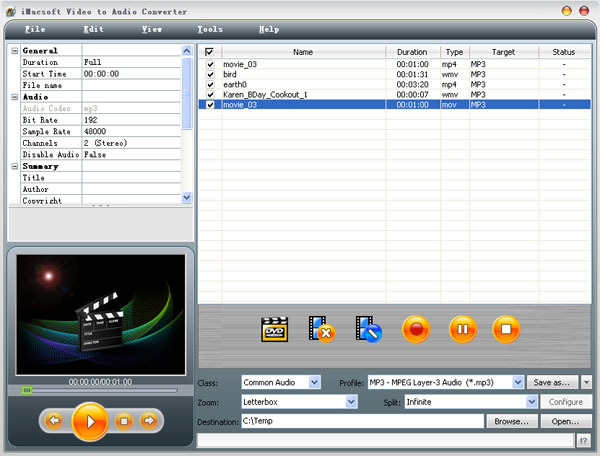 iMacsoft Video to Audio Converter is very easy to operate. With its user-friendly interface, you can convert video to audio without any learning curve. Download iMacsoft Video to Audio Converter for free and have a try just now! How to extract audio from video to make ringtone for iPhone? How to convert MP4 to MP3 audio files? How to convert WMV to MP3 files?